Let’s take a look at the most common mangrove in the aquarium hobby Rhizophora mangle or Red mangrove. I’m not going to go into great detail about mangroves in the wild and how they grow but I will touch on how they go about doing their thing. Planting your red mangrove -The above picture is a picture of one of my mangroves and the arrow is pointing to the lenticels (gas exchange hole), which is how mangroves are able to adapt to such low oxygen conditions-such as growing in water and mud. The picture above also shows the prop roots which is another reason they can grow in water, as they grow above it. One of my observations is that the roots should be anchored (planted) in some sort of growing medium (sand, mud, silt). What this looks like (Above pic) is putting the seed pod(s) in the sand as opposed to have them floating in the water, you will get far better growth using this method. If they are always floating in water the mangrove will not thrive and possibly wither away, as it can cause the mangroves seed pod to put too much energy to producing roots(this is not always true but coupled with low lighting-at least weak growth-at worst death). *If you have some bonsai experience this can come in handy to grow them in a shallow medium. Just be careful when trimming roots as the roots are a spongy type of roots under the soil and red mangrove are finicky about root pruning. Getting aerial roots on your red mangrove comes down to a couple things. To spray or not to spray? There seems to be a consensus that spraying your red mangroves is good for them, but why is that? First let’s look at how mangroves deal with salt, because salt is bad for any plant-it’s just mangrove have found a way to deal with it and thrive in that environment. There are two ways that mangroves deal with salt water-don’t let it in in the first place or allow it to pass through but kick it out and let the rain deal with it. The picture above is a Red mangrove leaf off one of my mangroves and if you notice or have a mangrove in your tank it’s a very waxy stiff type of leaf. The reason for this is to limit the water loss and the leaf is where a lot of fresh water is stored. Reds are able to close their pores off to limit water vapor loss during photosynthesis. They are also able to point there leaves directly at the sun to avoid the harsh tropical sun if it gets too intense. The main way Reds deal with salt water is to prevent the salt from entering from the roots via there spongy suberin(waxy material related to cork)roots. These roots prevent 95%ish of saline water from entering and the extra salt is stored throughout the tree. There seems to be conflicting theories on this, as some say it’s stored in the leaves then the leaf is dropped, but other stories say those leaves dropped have the same saline % as normal green leaves. Not being a scientist myself I’ll say whatever floats your boat. * So the main reason to spray the leaves down is to help red mangrove fresh water loss and help clear the pores of dust as red mangrove do not extrude salt through their leaves. This also simulates there natural environment getting rained on all the time-I find that this should be done a few times a week( I usually do 1-2 times with RO water as RODI water seems to be too pure and can have a negative effect long term. This is just my observation so you’ll probably be fine with RODI. Now Black mangroves(above) is a very different story-mostly. As you see above black mangroves take in saline water, but the main difference is they expel it out there leaves and let the rain wash it away (white mangroves do this slightly differently but gonna lump them in here too). They have a different growing style but have many of the same aspects. Normal you find black mangroves more inland as they have the more typical trunk like your everyday tree but you can find them mixed in with red’s. The main reason you find them more inland is there roots grow underground, but due to the fact that they grow in the same ground as reds that’s hypoxic (no 0²) they grow pneumatophores. Pneumatophores are roots that grow above ground straight up and take in 0² (via lenticels). So it’s imperative you spray black mangrove leaves completely, as the salt will build up on the leaves if grown is a marine environment. What this looks like, if you want them in your aquarium, is to some get sort of container or aquarium and have the water lvl just below the growing medium (sand, mud or the like), and place the seeds on the sand and wait. Make sure the top of the sand is moist as this will trigger growth. Here’s the tricky part. There are two main factors to getting you black mangrove to grow pneumatophores. Time which is simple-Just wait. Mine started to form them just after the one year mark. Lighting. This is very important and sadly most people set ups are not cutting the mustard(not all just most). There seems to be two methods that people approach mangrove, when adding them to their system. The first thought is to add one or two to their sump and using a Spiral CF bulb to grow them-this is very inadequate for long term health. The other method is to stuff as many as they can into a tank and grow them for nutrient uptake(which they don't take a crazy amount unless you have a lot), which they may or may not have proper lighting but again this is not a good practice. Important rant “Mangroves should not be an afterthought when adding them to your system. They are living things and should be treated as such. I’m not trying to be a crazy person here but I think they should get as much attention as sps or any other organism. “End rant. Now that that’s over let get to what it should be. If you’ve ever been to the tropics you’ll notice right off that bat that the sun is super intense! The reason is,is the sun is directly above you as opposed to a slant in the northern and southern hemisphere. This is where mangroves thrive. * Your lighting should try and emulate this. Let me give you an example of what I mean. So what do you use? Well I’ve had good results from and 8x24T5H0 and MH. Be wary of metal halide as you want intense lighting but don’t want to cook the leaves off. If it’s too close the leaves will start browning and shriveling up. Right not I’ll be using a full spectrum LED setup. My setup is capable of putting out 20000 lumens and uses high end LED’s. The fixture is intense BUT it’s a few feet away from the mangroves. 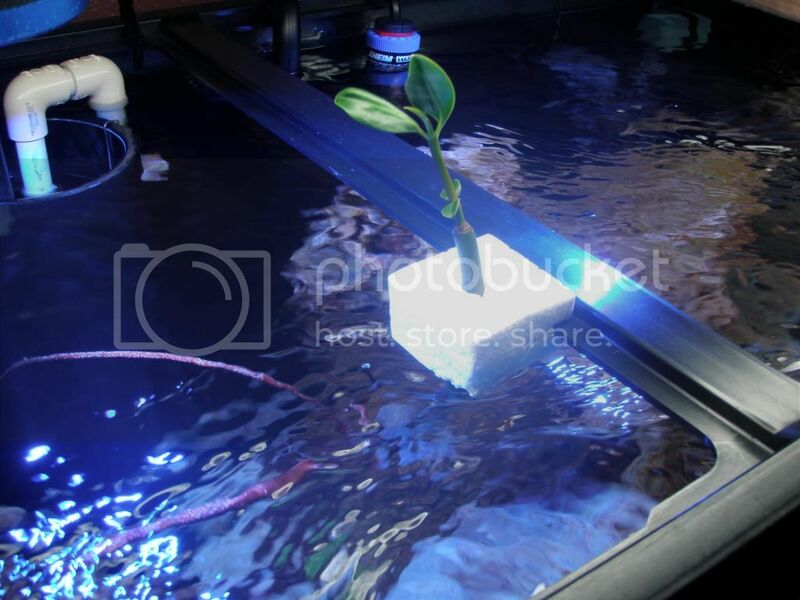 I’ve had good result growing plants in my vivariums and I expect the same from the LEDs and mangroves. I will update this as my results come in. Getting compact growth Here’s where I’m gonna teach you some bonsai techniques.First off you need to make sure your mangroves are healthy and growing strong before you work on them. All my mangrove are over 2 years old with my oldest being 5 years old. Just make sure they're healthy before you try this as it will stress the tree. Red mangroves have a long and leggy growth pattern and to help rectify that in your aquarium you trim. Also bright light, much like where they grow, will also help prevent long growth. Low light will force the tree to extend to reach for the light. Shaping you Mangrove This is a little advanced-so if you unsure I would search Google on wiring up bonsai. First thing is use Aluminum wire as mangrove will scare very easily, and if you intend to use these in your aquarium-copper is a no no if you have anything but fish in your tank. If it’s for you aquarium I would still use aluminum as it’s softer, cheaper and much easier to work with. Here’s how you do it. It’s best to leave the wire on for 2-3 month for the branch to set-to take the wire off get a good pair of wire snips and cut at the bottom of each wrap around and pull the little piece off. Tips and tricks Mangroves grow very slow because a lot of their energy is spent dealing with salt and growing in a marine environment. If you want to speed up the growth of mangroves grow them in fresh water. You’ll get much faster growth. Grow them outside in the summer if you can-nothing beat the sun for growth! Just make sure temp will not go below 41[sup]0 [/sup]*as that is the lowest temp they will tolerate and even then I don’t let them go below 60[sup]0[/sup]. View it as a long term project-Nothing good comes fast from neither bonsai nor this hobby. Maybe you’ll find it enjoyable and get into bonsai’s and become one with nature lol. Great post! You mentioned growing mangroves in freshwater several times, could I literally plant them in my 10 gallon freshwater to get better growth, then move it to my marine tank? The 10 gallon freshwater tank is going to be planted with elodea soon, so its like a forest of it. Could I just add some more sand and put a red mangrove in? And also, how long does it take to develop the pyramid shaped roots that some of yours have? Yes you can grow them in fresh water fine-that last picture is one of my mangrove thats been growing in fresh water for 4 years. You need to convert them to salt water VERY slowly as in like a month-you'll shock there system if it wam-bam. Yes you can add mangroves to your palnted tank-just add a littel more sand. It took that one you see about 3-4 years to get those roots and it's has another arieal root on the other side just starting out. 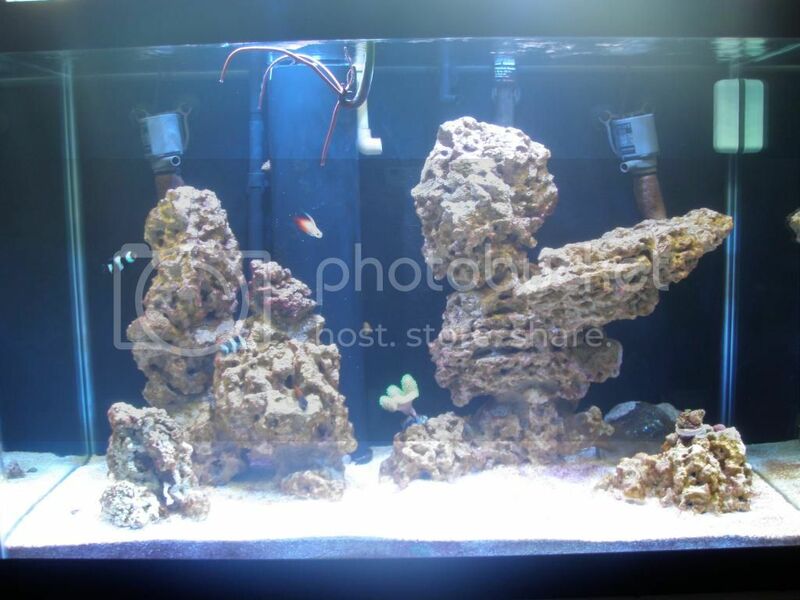 Ok, how would you suggest switching the mangrove over to saltwater? Maybe putting it in a bucket of freshwater, and slowly (over a couple days/weeks) adding salt until it is at the specific gravity of my marine tank? Interesting read. I like your original tank picture. 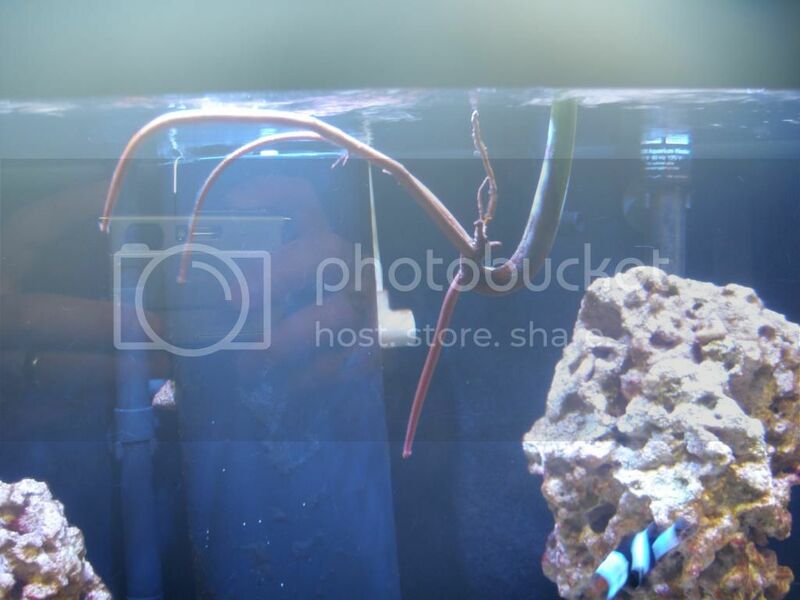 If I purchase a couple of mangrove shoots, how would I get them to adapt to a 20" deep tank? Could I start them off in sand in tupperware and slowly lower them to the tank floor after they grow vertically? Thanks. Any source for finding the longer pods? I'll have them indirectly under MH and T5s so light should not be a problem. In my fairly new 65 I'd like to have my mangrove to have supporting roots. However a 65 is quite deep. My mangrove has been in the tank for a while now and the roots are growing very well. However they seem to be searching and the tree is bending upward towards the light. I'm wondering if all this time not being in substrate will cause the tree to grow even more slowly or possibly die due to a lack of the fine off shoots on the roots. The roots thus far are the heavy stocky roots. I'm also thinking that I'm gonna have to start training the roots to head down to the substrate. Anyone have any thoughts? I know this might seem like a random post. However everyone that ever posts about mangroves or shows their mangrove builds. All talk about or show shallow tanks. I'll be waiting to hear from you. I wanted to put up a pic and while I was updating my laptop, my cat decided to lay on the keyboard......freezing my laptop completely. If I should ever figure out how to get it to turn on, I put a pic up of what's I've got going on. Up close of the roots. The current health of the tree. I believe its 5-6 months old. Great thread Giga I am so thankful for your wealth of knowledge on the trees. What's a good 4 bulb T5 combo for growing mangroves. I got my 3 mangrove pods the other day and they are floating on the surface of the tank water in some styrofoam. I'd like to anchor them down a bit. Could I add them to a tupperware cup of sand covered in sand to blend in with my rock? Make any sense? I'll snap a picture and post in a few. Larger of the three (only one with roots) feels a little squishy. Should I pull it from the SW? I see these floating, but I thought red were good to plant into sand????? ?